ROMANCE BOOK PARADISE: Nina Jade Singer, author of Secret of the Knight & Giveaways! Nina Jade Singer, author of Secret of the Knight & Giveaways! Today we welcome paranormal author Nina Jade Singer to Romance Book Paradise and she came bearing gifts! But before we give over to her, check this blogs sidebars for links to Helen Lacey's Celebration tour for mega giveaways! And there are still more places to visit and more books to win with Tracy Sumner! Hello everyone. I’m thrilled to be here at Romance Book Paradise. I recently celebrated the release of my first novel, Secrets of the Knight, from Crescent Moon Press. Just today, I rediscovered the excitement of reading while assisting in a fifth grade class. A part of their day was spent on what the teacher called ‘Book Talks’. These were mini presentations the kids gave about a book they’d recently read that they wanted to tell their classmates about. I have to tell you, for 5th graders, they were quite impressive. These kids all did a great job of bringing the story to life for their classmates. Amazingly, not one child looked bored or distracted. That’s excitement. Watching these presentations reminded me how much pleasure a book can provide. I thought about all the books I would love to do a ‘Book Talk’ on, too many to count. Sure, I belong to a book club. But the task of picking one book every few months is almost agonizing for me. There are so many I’d like to recommend to others, so many that I know they will enjoy because they’ve brought so much joy to me. 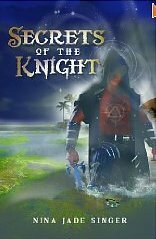 Please read on and I’ll tell you a little about my own book, Secrets of the Knight. I’d love to hear your comments. I've always loved stories of the supernatural. With mystery, suspense, and a good dose of romance. After years in the corporate world, I had to start writing my own such stories. And I had to do it New England - near mystical Salem, Mass. One lucky commenter will receive Secrets of The Knight. Followers and commenter’s of the blog tour will go in the grand draw of an Amazon Gift Certificate of US$100.00! For the full itinerary and more chances to win, check the AUTHOR PAGE! I think your book sounds fun and intriguing. My middle grade novel, The Christmas Village, came out this past fall, and I had a ball reading from it and talking with kids in the 3rd to 5th grades. They were SO engaged. You're back! I hope you enjoyed your vacation time? Thank you for coming along! Congrats on your release! You do the most sweetest thing ever- writing for young ones! And then connecting with them by reading to them. Thank you for coming along! The island/supernatural/suspense angle makes this sound like an intriguing read. Hello Joy, it is an intriguing book! Thanks for coming along! Hello Nas. Hello Nina Jade. This was great. I loved hearing about your school experience. Nothing like seeing children delving into books. Did I wish you a happy New Year yet Nas? If I didn't, have a great 2012 and may we continue to enjoy our interaction. Hi Nina, your books sounds intriguing. Your book sounds FABULOUS!! I can't wait to read it! And I'm looking forward to having you as my special guest on my own blog tomorrow! All arranged by the lovely Nas. I'm becoming intrigued by this book the more I read about it. In paranormal romance, how much importance does one give to the main characters? I would imagine that the paranormal world is the main work of the author rather than the characters? Am I wrong? I've also been called a bookworm by some of those closest to me! Thanks for you comment. I'm so glad you stopped by. Congrats on your release of the Christmas Village recently. I'm so glad you stopped by and thanks for the lovely comment! Thank you for stopping by. I'm so glad you think the book sounds intriguing. It really was something to watch those kids talk about books. I'm so glad you stopped by to read the post and commented. Thanks for stopping by and reading the post. I appreciate your comment. I'm looking forward to being your guest tomorrow. Thanks for stopping by! Interesting question. I guess I don't see writing paranormal as all that different in terms of character than say contemporary. I try to make my characters come alive in the worlds I've placed them in. And then I throw a bunch of stuff at them to deal with. Mine happen to have to deal with witches, vampires, and sorceresses. Hope that makes sense!! Congratulations on your book release, Nina! I taught elementary school for almost 20 years. Book Talk was always my favorite part of the week. The excitement certain books caused was fantastic. I loved it when a book would be passed around the class based on Book Talk recommendations. I'm halfway through reading Secrets of the Knight and I have to say I'm truly loving it. I love the atmosphere, the characters and the whole story. Wow. Twenty years of teaching. Kudos! Thanks for stopping by and commenting on the post. Thank you! I'm so glad you're enjoying Secrets! Hi Nina and Nas. Nina, your book sounds fabulous. Am just about to fire up my Kindle. I wish you wonderful sales on your debut novel. Good luck with it, Nina! An intriguing cover, and the story line sounds fascinating, too. Is it related to voodoo? Thanks for stopping by and for the lovely comments! Thank you for reading the post. There are definitely voodoo elements in Secrets. I appreciate the comment! I loved reading your Secret's of The Knight! It had all the elements I like- mystery, thrill, adventure and romance!